Prophet T.B. Joshua of the Synagogue Church of All Nations says he is not a witch doctor as he is being described by some Ghanaians. Prophet T.B. Joshua has discounted rumours that he is claiming glory for Ghana's victory at the Under-20 World Cup where the Black Satellites won the ultimate in Egypt, beating Brazil in a bitter final. 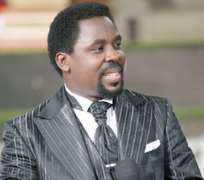 T.B Joshua, who was preaching to his congregation on Sunday, also described himself as the gentle donkey which God uses to speak His opinion to the nation. He has come under heavy criticism in the last couple of weeks, when the media widely reported video footages that suggested he was claiming glory for the Satellites' success story in the tournament. T.B. Joshua on Sunday played back a recorded conversation he claimed to have had last Thursday, with the coach of the Nigerian under-17 team, in which he told the coach how Nigeria's last group game in the ongoing Under-17 World Cup would end even before it was played last Friday. Nigeria won the game by 2:1 against Argentina, just as the recording had predicted it would end in a one-goal margin in favour of Nigeria. Meanwhile, the General Overseer of the Gospel Light International Church, Bishop Matthew Addae-Mensah, is daring Rev. John Anto to spill any destructive secret information he claims to have about him. He was reacting to threats by Rev. John Anto to spill secret information which he said was potentially destructive after the Bishop criticized claims that it was Prophet T.B. Joshua's prophecy that helped Ghana to win the Under-20 World Cup tournament.